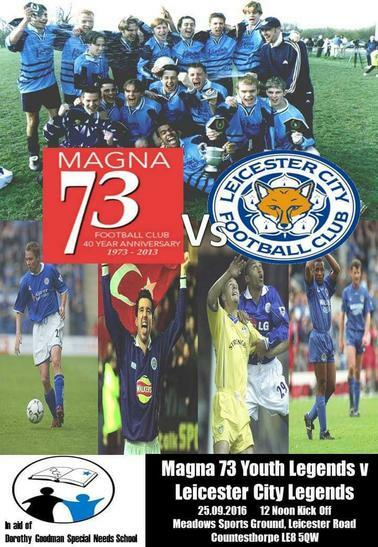 This Sunday (25th September) Magna 73 legends will be playing Leicester City Legends at the Meadows Sports Ground, Countesthorpe in aid of Dorothy Goodman. The Leicester City legends will feature Steve Guppy, Julian Watts, Steve Walsh, Matt Piper, Julian Joachim & DGS Ambassador Muzzy Izzet. As well as Boxer Rendall Munroe and musicians Jersey Budd & Chris Edwards (Kasabian). Please come down & show your support.